You’ve heard the advice. No happy kid photos, they raise less money than sad faces. Focus on larger gifts. Millennials don’t do mail. I heard a counter, fascinating fundraising story Friday. 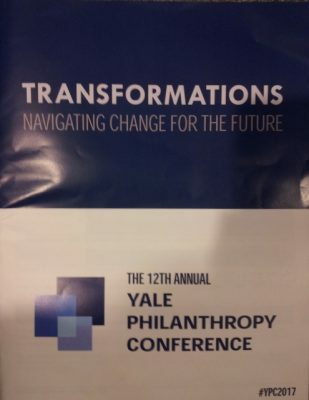 It was shared by the closing keynote speaker at the 2017 Yale Philanthropy Conference .Richard Shadyac, Jr., President and CEO Of ALSAC. ALSAC is the fundraising and awareness building organization whose sole mission is to raise funds for St. Jude Children’s Research Hospital. ALSAC provides three-quarters of the funds that support St. Jude. With a theme of Transformation, Mr. Shadyac generously shared his story and a lot of ALSAC fundraising data that might challenge some of your assumptions. St. Jude Children’s Research Hospital was founded by Danny Thomas, an actor, comedian and star of the The Danny Thomas Show. Danny Thomas was the stage name of Amos Muzyad Yakhoob Kairouz, an American citizen of Lebanese heritage. You can read the story of St. Jude’s founding here. When Danny Thomas founded the hospital, he didn’t want the doctors and researches to worry about raising money, which he took on as his commitment. As part of his fundraising, he approached other Arab-Americans to give back to their adopted country. Folks came together to found ALSAC, American Lebanese Syrian Associated Charities, a 501c3 with the sole purpose of raising funds for St. Jude. Today, the donors to ALSAC represent folks from all backgrounds. But this remarkable founding story by Arab-Americans other than Danny Thomas was unknown to me. Mr. Shadyac,whose father was the first CEO of ALSAC, said that when he took over in the 2009 as the third CEO, the recession was taking its toll on giving. So he made some gutsy decisions.One in particular was to invest heavily in direct mail, as everyone else was pulling out due to declining returns and rising costs. But that decision was the right one for ALSAC. Direct mail works for them, he said, including mail to millennials! He described a data-driven department, investing in technology, donor service and research that drives their fundraising. He and his staff are driven by a passion for the mission, taking seriously the commitment they make to the children and families they serve, who pay nothing for their treatment, travel, food or housing during the 3 year average stay. ALSAC is on track to raise $1 billion (with a B) from 10 million donors this year. 68% of their giving comes from households making $75,000 a year or less. If you’ve read the Gilded Giving report on the drop in giving by middle and lower income households, this statistic bucks that trend. The average donation… hold on to your hat… is just $34. Their biggest solicitation source is direct response, with 45% of their donations coming this way. Second biggest at 20%, is planned and major giving. Mr. Shadyac started his talk with a video and photos slides throughout his talk. I noticed immediately that these were upbeat images, images of hope, caring, and even happy, smiling faces. The types of images we are cautioned not to use in acquisition mailings. So I asked the question about the images being shared with us. Mr. Shadyac said that if you had a spectrum, with harsh images of children sick with cancer on the left, and those smiling, joyous faces on the right, their philosophy starts in the middle and runs to the right. “We are selling hope.” Not false hope, as children are still dying from cancer. But when St. Jude started most childhood cancers were death sentences. Today, that’s an 80% survival rate for cancer. St. Jude’s shares all of its research and treatment protocols for free. Yes, the children are bald, signaling immediately that they have cancer. But at the same time, those faces beam hope. And one more, Mr. Shadyac wanted us to know, you’ll never see St.Jude use a child to ask for money. Never. One more opportunity from Mr. Shadyac for you: PSAs, Public Service Announcements, are highly under-leveraged for communicating your cause. While many of St Jude’s visuals (including TV spots and web images) portray moving and sometimes poignant situations, you’re right that the children and families never come across as pathetic. And whether happy or sad, all of the images are authentic and genuine, not contrived. This, I think, is one important lesson for nonprofits when it comes to figuring out how to tackle multimedia. The other is that St Jude’s images align with their overall message, which is not just one of hope, but also confidence and trust in the organization. And they align with the specific objectives of each piece. Nice point about the PSAs. Thanks, Gayle!